The Nürburgring is a shadow of its former glory, but is also a far more safer prospect than the full length version. Current F1 safety standards wouldn't allow drivers around the high and dangerous banking, but the track still retains its own charms. The home straight leads into the first sector Arena section, and after the hairpin, leads into the Schumacher-S, named after F1's German hero. The Nüburgring has a deal to alternate hosting duties with Hockenheim. The F1 layout of the Nürburgring nestles in the heart of the 22 kilometre full version, and although many are disappointed that the racing is too dangerous on the full-length track, the current circuit offers plenty of challenges of its own. With several overtaking areas, and the addition of DRS, we're unlikely to see a procession from start to finish. The focus is on aerodynamic efficiency at the Nürburgring as the cars run with maximum downforce, and it is always worth keeping an eye on the weather to spice things up. 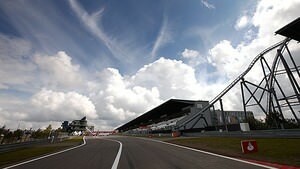 The track was involved in an alternating arrangement with Hockenheim, to play host to the German Grand Prix. They were due to host the 2015 race but early in the pre-season negotiations, Bernie Ecclestone confirmed there wouldn't be a race at the Nürburgring because there was "nobody there". Learn more about Nürburgring with the Pocket F1 Handbook. 13/07/2013 Vergne and Ricciardo - are they Red Bull ready? The sun is set to keep on shining over the Nürburgring so that we should have an unaffected race, weather-wise. it should be a good one! With the German GP hosts alternating each year, the last data teams (and we) have for Nürburgring is 2011.